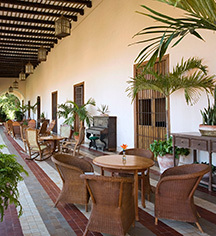 Hacienda Temozon, A Luxury Collection Hotel, was formerly a sisal hacienda of the 17th century and beautifully repurposed into a luxury 28-guestroom boutique hotel. With its coral walls and white moldings, this tranquil retreat, nestled in the tropical rainforest of the Yucatán Peninsula, is the perfect Mexican getaway. Among the natural attractions nearby are the Loltun caves, cenotes, and the Uxmal Mayan Ruins. Located on the grounds of Temozon is an open cenote, Xaca Mucuy. Cenotes, meaning “sacred well,” were revered by the Mayans as a natural water source and because they believed it was a gateway to Xibalbá, the underworld of the dead where life continued. It is a natural sinkhole, ranging from two to almost 35 meters deep, where guests can swim and relax in the cool water. Visitors are transported to the cenote by cart, pulled by Tabaco the donkey. Hacienda Temozon was chosen for a summit meeting between President Bill Clinton and Presidente Ernesto Zedillo of Mexico in 1999, and again for President George W. Bush and Presidente Felipe Calderón in 2007. 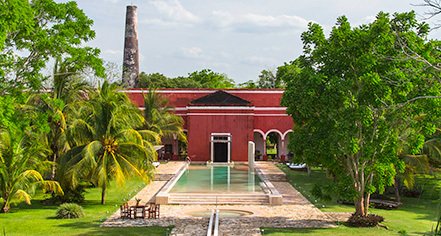 Hacienda Temozon, A Luxury Collection Hotel, was formerly a sisal hacienda of the 17th century and beautifully repurposed into a luxury 28-guestroom boutique hotel. With its coral walls and white moldings, this tranquil retreat, nestled in the tropical rainforest of the Yucatán Peninsula, is the perfect Mexican getaway. Learn more about the History of Hacienda Temozon, A Luxury Collection Hotel .